Rebecca Slayton. Arguments that Count: Physics, Computing, and Missile Defense, 1949-2012. Cambridge: MIT Press, 2013. 325 pp. with notes and index. 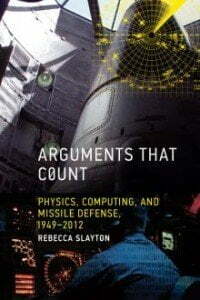 Rebecca Slayton has given us a very informative and original study of the relationship between science and public policy in her book, Arguments that Count: Physics, Computing, and Missile Defense, 1949-2012. The author shows how the theoretical and applied science paradigms of two different disciplinary communities, physicists and computer scientists (which includes software engineers and developers), have influenced their contributions to the development and deployment of various stages of missile defense from the early Cold War to the present. Dr. Slayton indicates that neither of these professional communities was of one mind with respect to the desirability or feasibility of building safe and reliable missile defenses. Scientists advocating for or against missile defenses were required to balance their ethical commitments about the nuclear arms race with their sense of professional integrity and commitment. This was true before and after the especially pugnacious debates during the Reagan administration over the Strategic Defense Initiative (“Star Wars” to its critics, although its supporters later proudly adopted the term after the box office success of the movie). Prominent physicists who were also advisors to the U.S. Department of Defense or other government agencies plumped for and against the Reagan or other versions of a nationwide U.S. missile defense system. The Reagan SDI was less of a workable proposal for imminent deployment than it was a view-graph aspirational construct, supported by a research and development program. SDI also became the subject of high politics when a 1986 Ronald Reagan-Mikhail Gorbachev summit at Reykjavik nearly skated into an agreement for nuclear abolition, only falling short due to disagreement over the U.S. missile defense plan. Advocates credited SDI with having helped to push the Soviet Union into economic default through defense overspending, or with having awakened Soviet leaders to the fact that they could not compete with the U.S. in defense-related science and technology. Opponents declared SDI a technical chimera and a political provocation that would enable an accelerated arms race. The 1980s were especially revealing of the inescapable relationship between science and public policy in defense matters, and the author shows how this generalization applies to missile defense throughout its tortured history. Even the end of the Cold War has not made missile defenses seem any less desirable for their proponents, including both scientists and politicians, nor any more superfluous for their doubters. However, the 1980s are a conceptual pivot from another perspective. As the author notes, software “emerged as the dominant computing challenge from the very first Defense Department studies of Star Wars.” (225). As SDI morphed into other proposals for national and theater missile defenses under President George H.W. Bush and his successors, the professional perspectives and proclivities of software engineers and computer experts became as important for the assessment of missile defense as were the insights and expertise of prominent nuclear physicists. For example, as the author notes, during the 1990s a growing challenge from regional conflicts encouraged more U.S. interest in deployable theater missile defenses (TMD) as compared to National Missile Defenses (NMD). Nationwide U.S. defenses took on more of the aspect of an experimental research and testing program. Even under these auspices the software related challenges in developing a reliable exoatmospheric kill vehicle (EKV) for ground-based midcourse defense (GMD) proved to be formidable for the contractors and their software engineers. The George W. Bush administration withdrew from the Anti-Ballistic Missile Treaty (ABM) in 2002 and began deployment of its nationwide missile defense GMD system in 2004 with interceptors in Alaska and California. The results of NMD testing under the Bush 43 and Barack Obama administrations have been mixed even under simulated conditions that seemed propitious for the defenses. In addition, the Bush 43 and Obama administrations also supported NATO’s plan to deploy U.S. missile defenses in Europe as part of the European Phased Adaptive Approach (EPAA). Since U.S. and allied governments have decades of experience in missile defense cooperation, this project might be more feasible than NMD, although the European project would eventually connect to the U.S. worldwide missile defense system grid. The EPAA is based on known and tested missile interceptor technology (the Navy’s SM-3 Standard missile is already deployed with Aegis combat systems on selected cruisers and destroyers). Nevertheless, the EPAA is contentious in the U.S and also in Russia, where President Vladimir Putin and his military experts consider it a threat to Russia’s strategic nuclear deterrent. We can anticipate that additional development and testing of software especially for BMC3 (battle management – command, control, and communications) will be required for regional as well as national missile defenses. One reason for the never-ending challenges posed by software and other digital derivatives is what the author terms “arbitrary complexity” (200). Human institutions and expectations create ever-shifting targets for engineers and software developers, as does a political climate driven by uncertainty and nonlinearity. As Dr. Slayton explains, when we consider missile defenses as physical systems, they have better prospects than they did during the Cold War. On the other hand, when defenses are conceived as information systems, the picture changes: “Today’s defenses confront fewer physical missiles, but greater informational complexity – a wider range of threats, emerging from a larger number of regions, in uncertain and changing ways” (200). Missile defense in a multipolar world also requires more international cooperation than hitherto for the stationing of interceptors, radars and other assets. This cooperation is not merely a diplomatic nicety, but a technical necessity. The shifting sands of U.S. plans for missile defenses in Europe under Bush 43 and Obama show how true this is. Dr. Slayton’s insightful and thoughtful work fits within a genre of Cold War and subsequent writings on the relationship between science and defense policy. With regard to discussions of missile defense, it is a worthy successor to Frances Fitzgerald’s Way Out There in the Blue: Reagan, Star Wars and the End of the Cold War and the relevant sections of Freeman Dyson’s classic Weapons and Hope. It should be of interest to academics in the field of national security studies as well as to those actively engaged in policy formulation and technology development related to missile defense. Stephen J. Cimbala is Distinguished Professor of Political Science, Penn State Brandywine, and is the author of numerous books and articles in the fields of international security studies, defense policy, nuclear weapons and arms control, intelligence and other fields. He is a graduate of Penn State, having received his B.A. in Journalism in 1965. He received an M.A.in 1967, and his Ph.D. in 1969, both in Political Science, from the University of Wisconsin, Madison. Frances Fitzgerald, Way Out There in the Blue: Reagan, Star Wars and the End of the Cold War (Simon and Schuster: 2000); Freeman Dyson, Weapons and Hope (Harper and Row: 1984).